Get ready for some StraightTalk on a topic we all love: business models. Here in Post No. 26, our shining guest star, Linda Finley, talks about what they are and how they are BFF (Best Friends Forever) with business architecture. This installment is based on our recent interview with her. Start from the beginning. What is a business model? Linda: “A business model describes the rationale by which an organization creates, delivers and captures value. *” It articulates the value an organization provides, to whom, through what relationships, in which channels, and by what means. A business model is an articulation of how an organization looks—not how it works—which reinforces the purpose for its why. * Source: Alex Osterwalder, Author of Business Model Generation: A Handbook for Visionaries, Game Changers, and Challengers (See More Good Stuff below). The use of business models and the business model canvas has gained a lot of traction over the last few years. How have organizations benefitted? Linda: Business models bring us back to an organization’s purpose and what business they are in, so the models can be used in all kinds of different ways. Organizations use them just to understand who their customers are, the value they provide to those customers, why that value matters, and how it is delivered relative to the channels, relationships and activities the organization performs. Business models can be used by start-ups and established organizations. We see established organizations leveraging business models when they need to reinvent themselves or conduct a merger or an acquisition. Business models can even be used at the product or initiative level. As Linda tells us, business model representation and design are highly useful to any organization, regardless of its size or type. This includes for-profit, non-profit and government organizations (though they may use a slightly different name like “non-profit business model”). 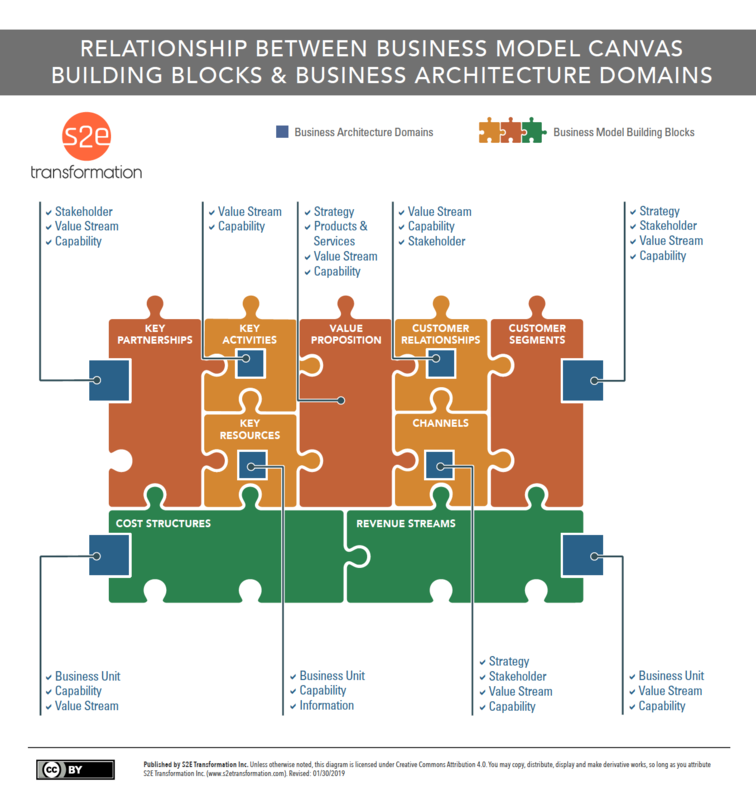 How can business models and business architecture work together? Inform changes to the business model (and even an entire reinvention of it) through innovative ideas and by helping the organization to perform “what if” impact analysis to test its choices before committing to them. Translate changes to the business model into concrete actions by first identifying and redesigning the impacted value streams and capabilities (and other business architecture perspectives such as stakeholders and products) and then bundling those changes into a logically scoped and sequenced set of initiatives to be executed. Communicate changes to the business model both by highlighting them on the business model canvas as well as through architectural target state diagrams, which provide people with a more specific understanding of what needs to change in their world. The handy diagram below shows the business architecture perspectives, which are most applicable for each of the nine building blocks on the business model canvas. One last question. What’s your six-word memoir for business architecture? Linda: Architecture creates context, context enables understanding. The canvas awaits your masterpiece. What will you help your organization to become? 5-Minutes With Linda Finley (StraightTalk podcast): Just in case you missed that link right there in the beginning, you can listen to the podcast with Linda on how business models and business architecture relate, which was the basis for this post. Business Model Generation: A Handbook for Visionaries, Game Changers, and Challengers (Book by Alexander Osterwalder and Yves Pigneur): The book which introduced the business model canvas and methods for creating, assessing and reinventing business models. This one is a classic and a must have. Value Proposition Design: How to Create Products and Services Customers Want (Book by Alexander Osterwalder, Yves Pigneur and others): A follow-on book from Business Model Generation which specifically focuses on value proposition. Osterwalder explaining the Business Model Canvas in 6 Minutes (Video): Here’s a six-minute overview of the business model canvas with the guy who created it. Linking Business Models with Business Architecture to Drive Innovation (Business Architecture Guild® White Paper): A Guild white paper that describes how business models and business architecture work together. Business Architecture and Business Models (Section 3.3 of the BIZBOK® Guide): Here’s the official word on the topic of business models and business architecture. Do Some Business Models Perform Better than Others? A Study of the 1000 Largest US Firms (MIT): An interesting piece which introduces business model archetypes. These archetypes are good to be familiar with so that you can help organizations to understand, streamline and even reinvent what they do. Check out Figures 1 and 2 on page 31 in particular. In honor of StraightTalk’s one year birthday this April, we created a compilation of some of your favorite StraightTalk content from 2017. Here’s a link and please feel free to share it with your friends and colleagues: bit.ly/best-straight-talk-2017.